On July 15, 2016, the Turkish people resisted a military coup for the first time in their history. Turkey is marking the 2nd anniversary of the defeat of the attempted coup on July 15, 2016, in which at least 250 people were killed and over 2,000 wounded. 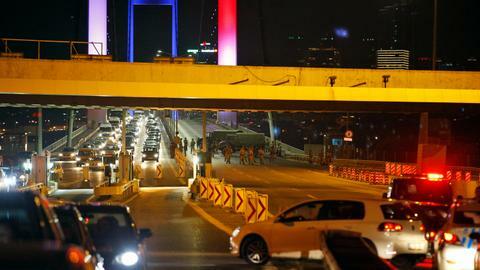 President Erdogan joined a huge rally at the July 15 Martyrs' Bridge in Istanbul. On the night of July 15, 2016 a rogue faction within the Turkish army attempted a coup aimed at overthrowing the democratically elected government of Turkey. What's happened in Turkey since the coup attempt on July 15, 2016? From terror attacks to operations in Syria to the economy to government system change, Turkey has seen some major developments since July 15, 2016. Sunday marks two years since rogue elements in the Turkish military unsuccessfully tried to overthrow the government. Behind the coup was the Fetullah Terrorist Organisation (FETO). But the people of Turkey defeated them. Turkey’s coup-marred history changed on July 15, 2016, when ordinary people fought a group of rogue soldiers. TRT World spoke to two of them. One of the most underreported aspects of the fallout of the attempted coup was the ongoing trauma that both its direct and indirect victims face until today. On this day two years ago the Turkish people defied a coup attempt to preserve their democracy. In keeping with history, the vast majority of the Western press that constantly advocates for democracy aligned with undemocratic forces. After failing to make inroads into Turkey, the group behind the failed coup attempt is now looking for ways to remain relevant in the US and Europe. Did the attempted coup derail the Turkish economy? The Turkish economy rebounded strongly after the failed July 15 coup due to strong government intervention. Now the impact is being felt on the wider economy. Many hope that the post election period will bring about lasting economic stability. Dr. Tarek Cherkaoui from the TRT World Research Centre says that western media's coverage on July 15 coup attempt showed total disregard for journalistic standards. Turkey experienced a deadly coup attempt on July 15, 2016, which claimed the lives of more than 250 people. We asked to Hasan Basri Yalcin, Associate Professor, why FETO poses a security threat to Turkey. Prof Dr Sadik Unay says that poor economic performance tends to trigger a situation that sometimes results in military coups. On July 15, 2016 a faction within the Turkish army attempted to overthrow the government. The citizens of Turkey stood up against the coup plotters and managed to prevent them from fully executing their plan. Fethullah Gulen laid the groundwork for an organisation called Hizmet or Service in the 1970s. His religious credentials gained him a strong and loyal following around the world which he later exploited for his own agenda.